A while ago, I spent a few hours with another volunteer at Wayside Waifs going through a rather large box of donated cat toys. Sadly, about half had to be thrown out because they were deemed to be unsafe for cats to play with - at least while unsupervised. Many of these were still in their packages - purchased, no doubt, in a store's pet department or even in a specialty pet store. It's probably a bit surprising and certainly a bit of a disconnect to think that products made for cats and dogs aren't safe for them. Yet that is often the case. Why would products made for pets be unsafe? Many pose a choking hazard. Thankfully, this is an easy problem to fix. When purchasing a new toy, examine it for small attachments that are of a size that could be swallowed, or are small enough for them to choke on: mice might have small plastic eyes attached, wand toys might have bells. Balls might be wound with yard that can come unraveled and ingested. If you see such attachments, clip them off and you should be good to go. In addition to choking hazards, some "classics" can cause major medical issues if ingested. Who hasn't heard of the classic 'cat playing with a ball of yarn'? Unfortunately, yarn, string, twine, rubber bands, thread and other such items can cause intestinal blockage or perforation - both of which are life-threatening issues. I know this firsthand. Years ago I'd left my sewing machine out, along with a dress I was mending. Ryker's older brother, Caleb, decided to munch on the spool that was threaded through the machine. I didn't notice - and three days later when he became listless and stopped eating, the vet discovered the thread had perforated his intestines in almost a dozen places. He would have died without emergency surgery. Needless to say, I am extremely cautious now when doing that rare bit of sewing or knitting (since I'm not that crafty a person Faraday, Max and Allie are fortunately pretty safe around here!). If you ever do see a bit of yarn or string coming out the back end of your pet, please don't pull on it - that might cause intestinal damage as well. Best to have it checked out by your vet to ensure it's properly removed without harm to your dog or cat. 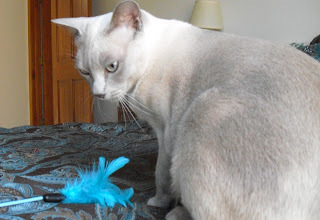 Feathers can cause intestinal trouble if ingested too. So as dearly as Faraday loves his wand toys - and as much as they love Da Bird - once playtime is over, those items get put back in the drawer. 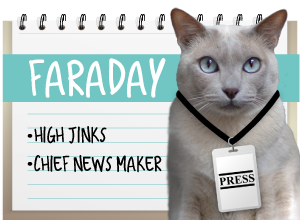 If that seems a bit extreme, consider this: not only can feathers be ingested and cause intestinal problems, but some cats like Faraday are extremely enthusiastic in their play and will run madly through the house holding a wand toy by its feathers and completely ignoring the 2 feet of stiff plastic handle protruding out from it. There have been times we were afraid he would impale himself on the wand part of the toy if he was unsupervised - he's just that fast and energetic! We don't mean to scare you away from playtime - it's a critical element in your pet's health and can provide both physical and mental stimulation. We're just suggesting you might want to use caution when choosing the toys that you'll leave out while at work or when going out of town. We personally can't think of another single toy that has caused more excitement around our house (and burned more kitty calories, too!) than feather wand toys. No, we don't leave them out unsupervised, but we get them out every day. 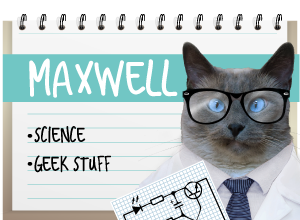 And if we forget, either Faraday or Maxwell can be found camped out on the counter right above the drawer where they reside. Usually looking at us plaintively until we cave and drag out Da Bird for 30 minutes of non-stop romping. FaRADaY: I don't know what she's so worried about - I always knowz exactly wher I's going wif it! Mom: (um, yeah, Faraday - and that's the problem!) We don't understand why there are so many dangers out there on the shelves either. Baffles us! Very important post! Thanks for the reminder. Excellent reminder on a very important subject. M really watches me like a hawk when I play too - to be sure I'm safe! 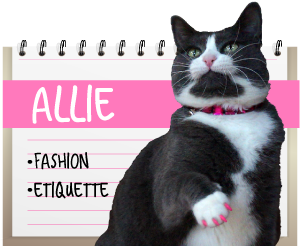 This is EXCELLENT information that every peep owned by a cat should know. My peep makes quite a few of our toys and I've watched her being ever so careful to make sure that anything and everything on those toys is as secure as secure can be. That's just pawesome Nerissa! We bet you love them too! This is VERY VERY good information. I keep all the toys in the cabinet after playtime and have stopped allowing the cats to play with cord after Felix swallowed about 12" of cord and was miserable for a week (I had no idea why neither did the vets) until it came out of his other end, intact. We were very lucky. Oh noes! Lucky indeed! The V-E-T said that thread has such an edge to it some peeps have used it to slice cheese - if it can be used that way, just think what it did to poor Caleb's intestines! No wonder emergency surgery was needed! Except for a small number of "safe" toys, all ours are packed away until my human pulls them out. Which is kind of frustrating because she does not pull them out enough! I hope your post not only serves as a warning, but also as a reminder to my human to play with us more! We love the new banner you have on the blog, it looks great! Sadly, cat toys can be so dangerous, thanks for the reminder. We elft a wand out the other day and our cat Vickie ate a piece of ribbon. We freaked out and called the vet, but since it was about a 2 inch piece, they said to watch and make sure she was eating and check the litter box to see if it passed. Well she was completely fine and eating normally so we were very lucky she was ok. Though one time, my dad's old cat ate a brillo pad! It expanded in his stomach. I don't know how that cat lived to be 16. HE went to the vet and the vet said to let it pass. My dad said he found pieces of brillo in the litter box for days to come. Yuck! But a good reminder to be careful. NO no no no! You had enuf trubble! We think your mom's paweseome for doing that!! And tails of our mousies too. They look cuter but there was one kitty on the CB who had to go to the hospital because he swallowed a tail and it about killed him. Oh my cat - RILLY? We didz not hear about that! Mowzers, these toys can be killers! Great Post! We usually plays with doggy toys (except for our rolly ball) because a certain hairy slobbery sister(Cinnamon) deemed that all toys was doggy toys! All our toys has doggy slobber on them. Mommy had a before cat that had to has a operation from eating a rubber band so she is very careful about what we gets to play with. This is such great information. 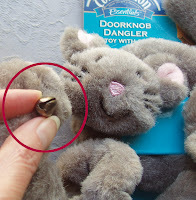 We are always amazed by the unsafe things we find on dog and cat toys (like bells and button eyes). As you advised, we snip them off before giving them to the furries! What great information! You'd think pet toy makers would think about these things, but they don't. Our mom removes the tails from our catnip mousies because otherwise, we chew them off. I inspect every toy that comes into our home and cut off bells, ribbons, etc. Sometimes even feathers. I don't understand why the pet toy folks continue to make toys that can harm our pets. Its like buying toys for young children! Same thing there too, huh? Mowzers! You boys (and Allie) are lucky to have such a well-informed mom. My house is run the same way. I'm allowed to play with string and wand toys only with supervision. Of course, the best way to play with string is for you human to be at the other end pulling it around the house for you to chase! I'm allowed to have all my balls and stuffed catnip toys all the time, but they don't have any yarn or dangly things that I could get wound up in my tummy or bite off. I ate a big piece of yarn once and I had to make several trips the vet and I was very, very, very, very lucky that it came out and I didn't need surgery. Whew! So glad you dodged the bullet on that one!! Thanks for this article, it's very important stuff to know! We've almost had choking incidents before. One must be careful! TBT here - I had to throw away LC's favorite toys (small pompoms) once after she swallowed 2 (on separate occassions) and had trouble hacking them back up. The first time, I thought she had learned her lesson. The second time they all went in the trash. Those were some of the very ones we threw out at Wayside Waifs. The very large ones are okay, but the package comes with ones so small they're not much bigger than a jingle bell. What are the manufacturers thinking??? Very impawtant stuff! Thanks for posting this. I had a ribbon *incident* a few years ago that just about sent me packing for the rainbow bridge. Emergency surgery and a rocky recovery. Now Glogirly is super careful about what she lets me play with. AND careful to pick up after herself when she's been wrapping gifts.